Wednesday July 14th 1926 I knit on the bag most of the day. Edith up town in AM. A long letter from the girls. I wrote Mabel McDougall. Thursday July 15th 1926 Wrote Ott Seibert and Hattie. I worked at bead bag most of the day. Walked up to the depot with mail before supper. Edith up town in evening. I here alone. Friday July 16th 1926 I wrote Fannie. Was busy with my bead work most of the day. Edith up town in AM. Both here in evening. 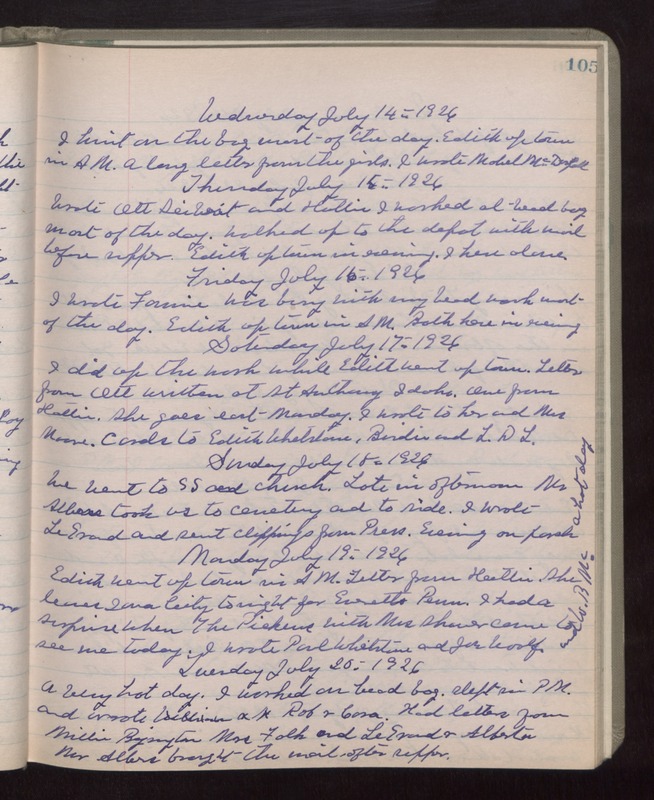 Saturday July 17th 1926 I did up the work while Edith went up town. Letter from Ott written at St Anthony Idaho. One from Hattie. She goes east Monday. I wrote to her and Mrs Moore. Cards to Edith Whetstone, Birdie and L D L. Sunday July 18th 1926 We went to S S and church. Late in afternoon Mrs Albers took us to Cemetery and to ride. I wrote LeGrand and sent clippings from Press. Evening on porch. A hot day. Monday July 19th 1926 Edith went up town in AM. Letter from Hattie. She leaves Iowa City tonight for Evertts Penn. I had a surprise when The Pickens with Mrs Shaver came to see me today. I wrote Paul Whetstone and Joe Woolf and to W B Mc---. Tuesday July 20th 1926 A very hot day. I worked on bead bag. Slept in PM. and wrote Rob & Cora. had letter from Millie Byington, Mrs Falk and LeGrand & Alberta. Mr Albers brought the mail after supper.